Smartrepel® Hydro is a nature-friendlier protection agent based on distinctive micro- encapsulated, highly biodegradable, non-PFC based technology offering exceptional, durable water repellency to polyester, polyamide and cotton-based textiles. With Smartrepel® Hydro AM, Archroma offers to brands, retailers and textile manufacturers a new, ‘universal’ water repellent protection that is applicable on all fibers - cotton and synthetic, and their blends. 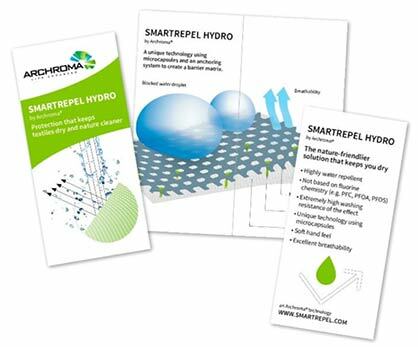 For more information on Smartrepel® Hydro, please visit our dedicated page: http://www.smartrepel.com.